The name Luke Nolan will go down in history as an integral part of the incredible racing legend Black Caviar.Nolen started his apprenticeship with Mansfield trainer and respected horseman Gerald Egan. He had his first ride in January 1998 at Wangaratta and booted home his first winner aboard Price Hike at Albury in March of the same year. Through the 2000s Nolen continued his rise up the Victorian jockey ranks and when he became number one rider for the powerful Peter Moody stable his career went from strength-to-strength. Nolen achieved his first Group 1 win aboard Wonderful World in the 2006 Caulfield Guineas for legendary trainer Bart Cummings; his second came a year later on El Segundo in the WS Cox Plate. His association with unbeaten mare Black Caviar pushed Nolen into the World spotlight as he was on board for 22 of the mare’s 25 wins. 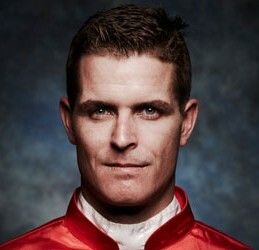 Nolen is a three-time premiership-winning rider in Victoria from 2009/10-2011/12. Luke can be booked to talk about those incredible years riding one of the greatest horses the World has ever seen!